Brian Dumal, who marched soprano for the Magic of Orlando for 2003, sent in this one. ^"Although meeting new friends and people was a plus, I couldn't have made it through without our dedicated staff. 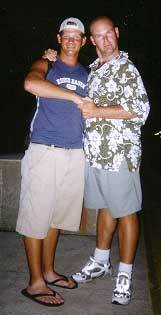 The picture I sent you is of Jim Rogers and I at Navy Pier in Chicago. He marched in 1993, 1994, and was the trumpet soloist in 1996 for the Blue Devils. He came to us late during move-in and ever since, he became one of our trumpet techs as well as a very dear friend. "Through all the pain of the summer, Jim would always be there for me. We'd talk for hours at a time before lights out. We discussed his experiences and mine throughout the summer. He even let me try on his rings from his 1994 and 1996 championships. I've never met someone so into living life to the fullest. His insight into other people made me think and start to feel why I was there. He helped me through the summer. And although fellow members of corps are great to befriend, having staff that truly cares about you is even better." Thanks Brian!